1. Heat oil for deep frying in a pan over medium flame. 2. Once the oil starts smoking, reduce flame to low. 3. Slice the plaintains directly over hot oil. 4. Increase flame to medium and fry till light golden brown. 6. Mix the turmeric powder, red chilli powder, salt, chaat masala powder and asafoetida powder in a bowl. 7. Sprinkle the masala powder on the chips and mix. 8. Garnish with the curry leaves. 9. Serve as a snack or as a side dish to rice. Tip: Slicing the plaintains over hot oil ensures they do not stick to one another and do not change colour. If desired you can slice them and keep in water to preven discolouring. Before adding it to hot oil, ensure all excess water has been drained from the slices. 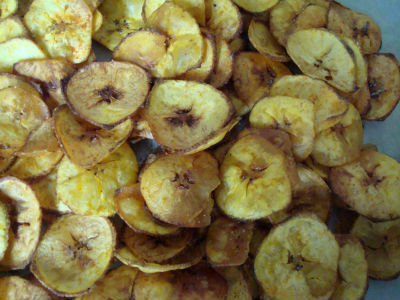 Feel free to comment or share your thoughts on this Vazhakkai (Plantain) Chips Recipe from Awesome Cuisine.